If you have to wear unique style mens dress shoes, you need to see what Giovanni brand dress shoes are all about. Giovanni shoes are all designed in Italy and look it with their sleek Italian styles. 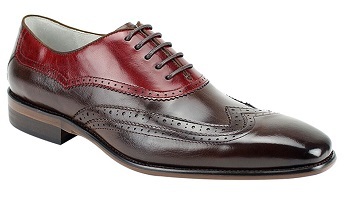 These brown and red two tone wingtip dress shoes are simply show stopping in style and design. Made of rich leather calfskin.